We’ve seen multi-masking, sheet masks and now bubble masks have become the latest trend in skincare. Lots of these products have originated from the Asian markets, and they have slowly made their way to the UK. A bubble mask, if you weren’t sure, is a sheet mask which has active ingredients that foam once applied. 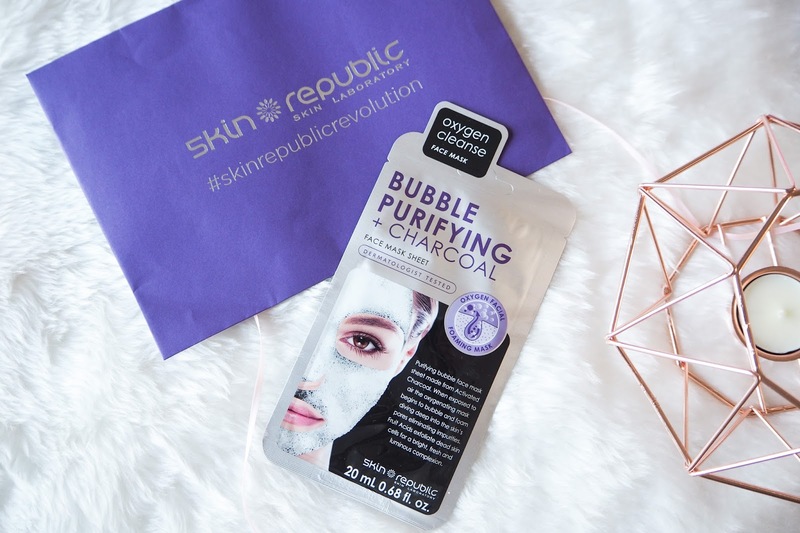 There are a few that have recently launched on the market, and I choose to road test the Skin Republic Bubble Purifying and Charcoal Face Mask Sheet. This bubble mask comes in a pouch; you have to rub the packet before you open it to activate the ingredients, so they can bubble up. Once open you can unfold the sheet mask and apply to the face. I have noticed with some face masks that the sizes are huge, they don’t fit or it gets in my hairline, but this one from Skin Republic was just the right size. It’s a black sheet mask which has a solution added to it, once applied the ingredients start to bubble and foam on top of the mask but also underneath on your top layer of skin. It’s a little strange at first but just feels like bubbles popping in the bath on your skin. This product has rich ingredients like activated charcoal and fruit acids, which react with the air to start the bubbling process. The ingredients can reach deeper into the skin to eliminate impurities and detox the skin. 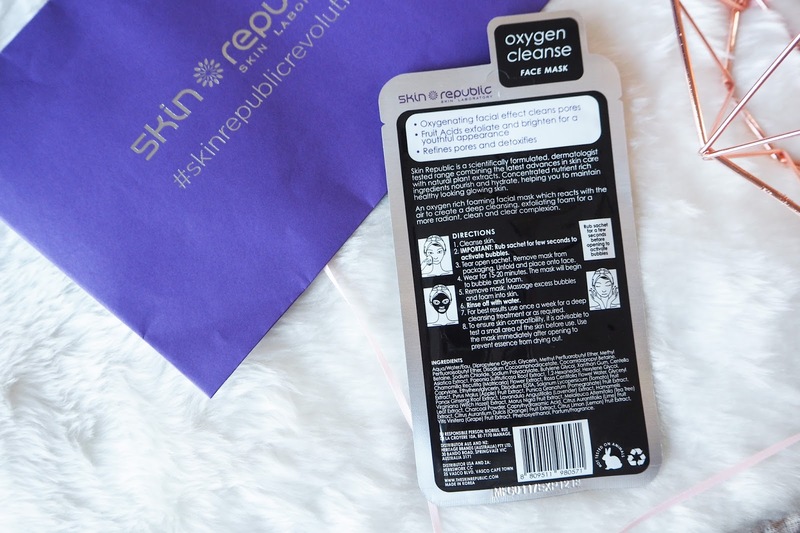 I really enjoyed using the Skin Republic Bubble Mask, it was a bit of a novelty at first but the bubbling effect really made me feel like it was working. 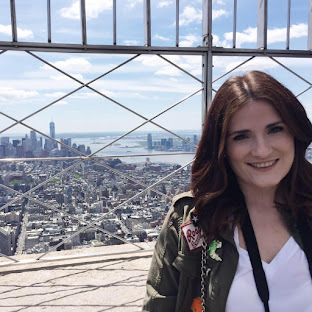 My skin did look perkier after using it. 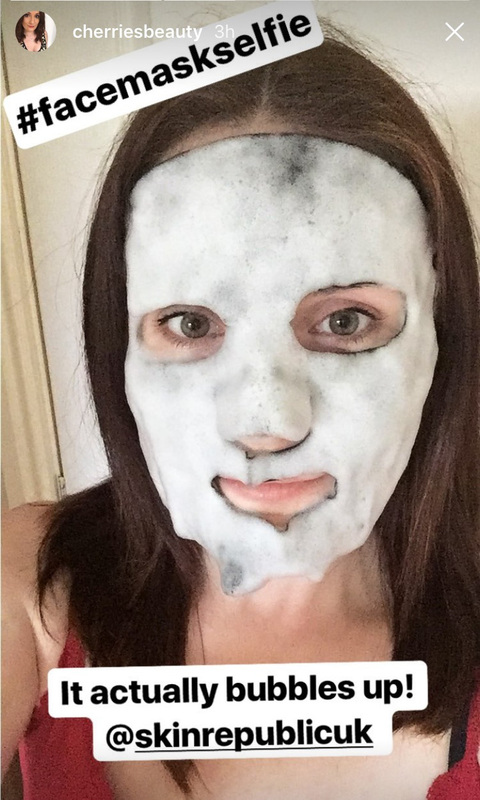 It isn’t the cheapest mask on the market at around £5 but it’s something new to try if you are now bored of the Garnier sheet masks! Did you even put a face mask on if you didn't Snapchat or Instagram Story it?! I love the look of these bubble masks, I definitely need to try one! Honestly I don't know whether I love or hate the idea of these bubbling masks. On one hand I think they're cool but then the whole thought of it bubbling on my face kind of freaks me out!